The MOZA SPARK power supply system equips the MOZA Air 2 with four power ports. The input port allows for alternative ways to power your gimbal, and the output ports provide ways to power the camera and other accessories like follow focus, Led lights, and monitors. The newly added Battery Management System(BMS) has greatly enhanced the Air 2's working time while powering the MOZA Air 2 and accessories. With comprehensively upgraded time-lapse functions, there are up to 20 optimizations helping users easily film various personalized and professional types of timelapses, such as motion-lapse, tracking time-lapse, zoom time-lapse and so on. All your inspiration can be captured by the MOZA Air 2! With the free combination of 3-axis and 8 follow modes, various cool shooting modes such as Inception Mode, FPV Mode, Sport Gear Mode, Panorama and Tracking are available. The iFOCUS is the 4th axis of MOZA Air 2, offering focus and zoom control when connected with the MOZA Air 2. There’s no limit to your creativity anymore. The MOZA Air 2 features a visually identifiable balancing information that can help guide users to adjust the gimbal to the optimal balancing parameters. Save a lot of time and energy to open up more possibilities and create more. MOZA Air 2 also comes with the mechanical memory quick release system, which can help you move the camera among different fixtures without rebalancing. Only adjust once at start and you are set to go! MOZA Air 2 includes a newly designed versatile and adaptable modular ecosystem to allow filmmakers to operate in whatever way is most productive for them. 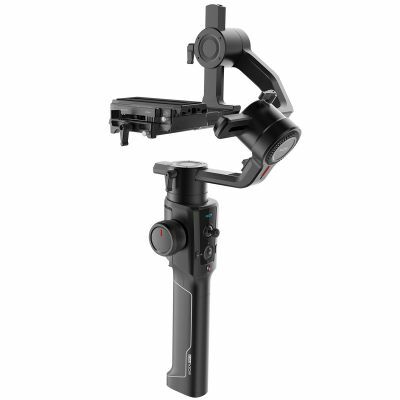 This means you can use MOZA thumb controller, iFOCUS, camera cage, camera backpack, dual handle to distribute control of gimbal pointing, FIZ and camera controls in whatever way makes sense for your shot. The extremely portable, durable and strong backpack provides easy transportation. It can not only hold the gimbal with 3-axis in any position but can also hold a complete set of photographic equipment to meet all your needs.